I am saddened titles like the one above need ever be written. Let me suggest instead, we do not control the makeup of the waters of justice and righteousness that roll down like an ever-flowing stream. The river isn’t under our control. RMN understands our mission to point to the waters of baptism that are fully inclusive of LGBTQ people… waters that call us to ministry as lay and clergy, as singled and partnered. However, these aren’t calm waters to be controlled. These are raging waters that drown oppression and discrimination of any kind.These are not RMN’s waters to muddy. God alone controls the rushing waters of justice. Reconciling friends, think about what first brought you to RMN. Remember your desire for freedom from oppression and injustice that you yourself experienced or that you witnessed in the life of your child or friend. Is not this desire intimately connected with the desires expressed on the wall pictured above? 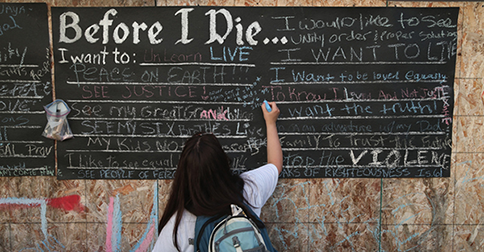 Before I die, I want to… live, see justice, see my brothers live, be loved equally, know the truth, stop violence. Are the voices of power and privilege calling for the status quo in Ferguson not echoes of voices in our own church that value the harm to an institution’s unity over harm to perpetrated against LGBTQ children of God? Are clergy that are attempting to silence angry voices in Ferguson not unlike clergy in our own church who attempt to silence angry LGBTQ persons? So what can we do? We can listen. The next Michael Brown is attending school this morning in your local community. He is one of your many neighbors who the system does not work to serve and protect—much in the same way The UMC does not serve and protect many in our Network. If you want to do justice, listen and help stories of oppression and injustice be heard. Don’t fool yourself into believing that we will ever achieve full inclusion in The UMC by ignoring Michael Brown. Our struggle is one and our place is in the raging waters as witnesses for justice.